The public hearing advertised on the sign was on Monday night. 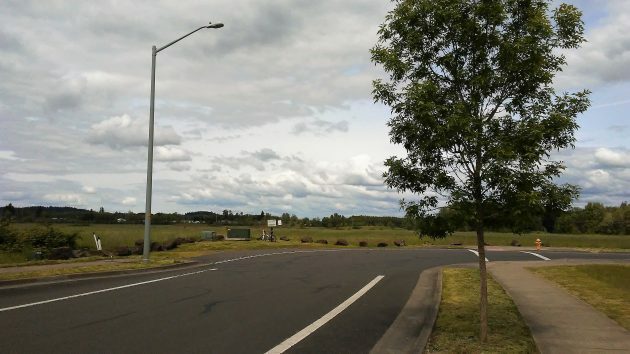 This is at the corner of Somerset Drive and Timber Ridge in northeast Albany, and those wide open spaces won’t be quite that wide open for long. 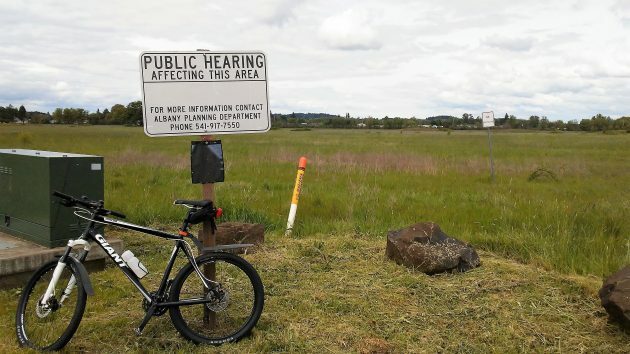 The Albany Planning Commission on Monday night approved a tentative plat for the Sumerset Subdivision, which calls for 142 single-family houses on the now-vacant land north of this spot. But of the 43 acres covered by the plan, nearly 18 acres are designated as wetlands and will be left as open space. The planning commission’s approval was unanimous. About a year ago the commission rejected a similar development plan for this acreage on the grounds that streets did not connect. In this plat, they do. Somerset Drive is to be extended toward the northeast, and Trinity Street to the southeast until they meet. This was made possible in a deal with the city of Albany, which is selling the developer 7 acres, which the city acquired a few years ago as part of a much larger acreage in lieu of foreclosing on an assessment for the costs of building Timber Ridge Street. The street construction was necessary to serve Timber Ridge school, then being planned. MBBH Development LLC, the Corvallis firm of Myles Breadner, plans to develop the subdivision in four phases of 29 to 41 units each. The development pattern looks a little denser than the subdivisions west of it. There will be about seven houses per acre. The average lot will have about 6,000 square feet, and the smallest 4,120. A band of open space along Truax Creek forms the northern boundary of the development. Timber Ridge School lies a few hundred yards to its south. This is the east end of Somerset Drive, which is to be extended in the direction of this view. How much debt forgiveness is there in this deal? Huh? None that I know of. A little high and outside of CARA but Kellum’s preferred area. No debt forgiveness, the developer is getting credit against fees for improvements he is putting in such as streets, but that goes with ANY development to one extent or another.. Here we go again! More expensive houses that no one can afford, in an area that is already packed with houses, that nobody can afford! Way to go City of Albany! Let’s be clear. A developer is betting (literally) that people will buy housing in the development. The “City” gave permission for the developer to place that bet. Sounds like the homes will be small and close together. If you have a regular size car or truck bet it will not fit in your drive way. I hope you’re right, but I’ll bet the opposite on 2 out of 3: big houses, very close together with very little green space, enough room for two “regular size” vehicles in addition to garages big enough to store a generation’s unused possessions. Looking on the bright side: every hideous, new, old-fashioned mini-McMansion built and sold removes a little excess demand for all houses at a time when we desperately need more supply and less demand. For those who want to blame it on over-regulation, I partially agree.